We are excited to announce that we are now on Facebook! NEW WESTFALL SPIRITWEAR IS HERE! Thursday, November 8th, 2016 at 7:00 p.m. 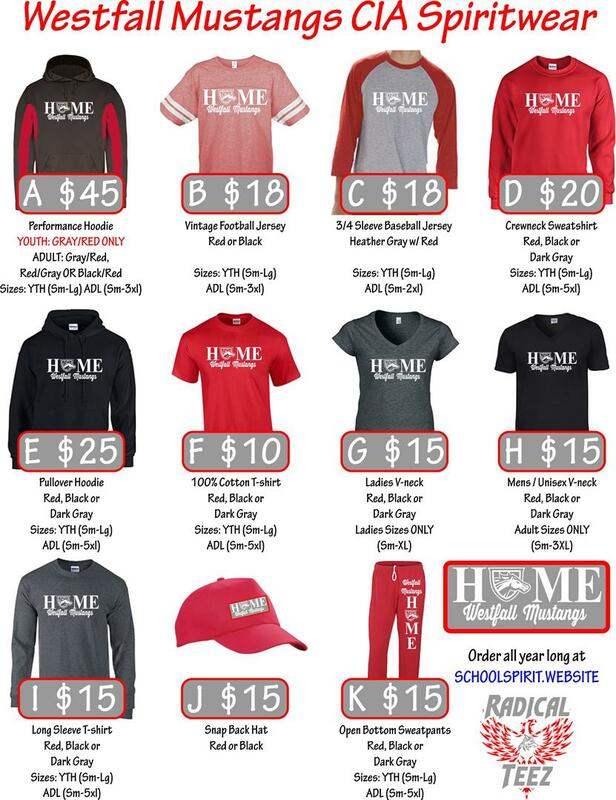 Spirit Gear Committee: New item, Westfall Home Apparel! Flyers go home next week with (Elementary / Middle School / High School) Need Order by 12/02/16 for Christmas Delivery. (Dropped off at school) Schoolspirit.Website Need new members to sell Spirit Gear at Westfall Events! Mighty Mustang Award Mr. Patete & Mr. Keller hanging the fat heads in the cafeteria. · Gatti’s & Kona Ice on Tuesday November 1st. · Duct tape the Principal and Dean fundraiser to Benefit Westfall families in need. Father/Daughter Dance - April 8th. · Theme: Butterfly Kisses and Dandelion Wishes. Show your Mustang Pride on with Westfall CIA Spirit Gear! The Westfall CIA Meets the Second Thursday of each month in the Elementary School Cafeteria! Questions? Concerns? How to get involved?